Have you tried a flat white? This is the first I’ve heard of it but it looks like my cup of tea, er, coffee. It’s a Kiwi invention – basically a strong latte, topped with swirled microfoam – and has been all the rage in England. A jet-setting friend of mine spent this week in New York and London and reported that Starbucks in England includes the flat white, while the Starbucks in New York does not. America needs flat white! I need flat white! Bring it. Posted on 8, June 2012, in Food and tagged British, flat white, starbucks. Bookmark the permalink. 10 Comments. i thought i knew it all about coffee and just learnt something new!! thanks!!! shall order it next time am in starbucks! i posted a photo of THE most yummy cappuccino i have ever had in London and now that i think of it it looks like a flat white!!! Yes, it really is a perfect alternative to a dry cappuccino. I wish I could’ve had one this morning! Wash out your mouth with soap!!! A flat white is a kiwi invention! Aussies always claim NZ inventions as theirs: the flat white, pavlova, Sam Neil and russell Crowe…. Yup. But kiwis have a big chip about things the Aussies steal. And Russel Crowe is rarely claimed. I think crowded house is the other one that’s claimed….. But flat whites are good. Even better, the triple shot flat white. However, More of a long black drinker these days. Oh, I didn’t know about that! What a lovely post on one of the things I love the most… coffee. And trendy coffee, it seems! Your blog is lush and thus… it is an instant follow. 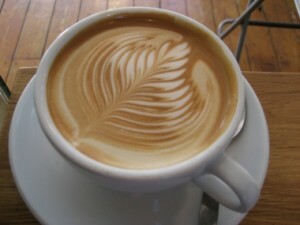 Just for the record you can get a Flat White in LA at http://www.espressoprofetala.com/ in WestWood. A lovely gem of a cafe if you’re in the area. Good to know it’s available stateside! Thx for reading!